Oscar-winning actress Tilda Swinton has finally admitted she posed as an old man for her latest film by wearing prosthetics and false body parts. She passed herself off as first-time actor Lutz Ebersdorf in a remake of the 1977 supernatural thriller Suspiria. Ebersdorf was credited with the role of 82-year-old psychoanalyst Dr Josef Klemperer, the film’s third lead. She had previously fended off queries about whether she played the doctor, but confirmed it to The New York Times. It appears the actress, who won her Oscar for the 2007 film Michael Clayton, was waiting to be asked that exact question. She told the paper that “curiously, to date, nobody has thought of it”. She read out a letter purportedly from him at the festival press conference, in which he apologised for not being able to attend in person. The film also stars Dakota Johnson as a dancer who enrols at an all-female Berlin dance academy, only to find out it is run by witches and is plagued by unusual incidents. As well as playing Dr Klemperer, Swinton’s main role is as the academy’s artistic director Madame Blanc. The film was directed by Luca Guadagnino, who also made Call Me By Your Name, which won the Oscar for best adapted screenplay earlier this year. 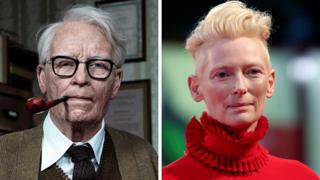 The director had previously dismissed suggestions about Swinton playing the old man as “fake news”. The New York Times said Oscar-winning make-up artist Mark Coulier was enlisted to help with the deception. Swinton has now revealed that it took four hours in make-up each day to play the doctor, and she even went so far as wearing fake genitalia. The make-up artist used prosthetics to thicken her neck and build out her jaw. Asked why she played the doctor, Swinton replied: “Undeniably, I would have to say, for the sheer sake of fun above all. Her final touch was to create an online profile for Ebersdorf on movie database website IMDB, although it now redirects to Swinton’s profile page. She had hoped the secret would remain intact, saying: “Frankly, my long-held dream was that we would never have addressed this question at all. Suspiria is released in the UK on 16 November.